TotalCourage Goes To The Great White North! During the Canadian Football League playoffs TotalCourage was invited to spend an entire weekend with the Hamilton Tiger-Cats professional football team. Our Executive Director, Colonel (Retired) Dee Daugherty, speaks to the athletes about the value of resilience and endurance. Dee hammered home the importance of mental toughness, communication and selflessness in the face of adversity. The Hamilton Tiger-Cats are a world class organization and their head coach, June Jones, believes that winning starts with individual character. Dee emphasized that in order to be champions everyone must be prepared to assume a leadership role. TotalCourage Bears Down in the Desert! The TotalCourage team kicked off 2019 with a compelling message of resilience, endurance, and selflessness. It was a tremendous visit with the talented men and women of the University of Arizona Track and Field Team. Parker delivered an inspirational message about the value of making a promise to oneself and to others and the importance of upholding those promises. The TotalCourage team was hosted by the outstanding Director of Cross Country and Track & Field, Fred Harvey. Coach Harvey’s emphasis on Winning with Character has created a legacy of excellence! Olympian Greg Foster shared his powerful story of personal endurance. The TotalCourage team enjoyed CBWA, “caring by walking around!” In the photos above we see Dee observing the Wildcats men and womens throws team. The TotalCourage character coaches are honored to be a small part of the Wildcat leadership and character program. TotalCourage Goes to Stephen F. Austin University! Dee Daugherty, Parker Schenecker and Greg Foster enjoyed a great visit to the oldest city in Texas, Nacogdoches! As guests of the legendary Stephen F. Austin University Head Track & Field Coach, Phil Olson, the TC team enjoyed a down home catfish dinner with the Coaches followed by a day observing practice and meeting all of the athletes. That evening Dee introduced Parker to the team and they were spellbound by his personal story of resilience, remembrance and the value of upholding promises and commitments. 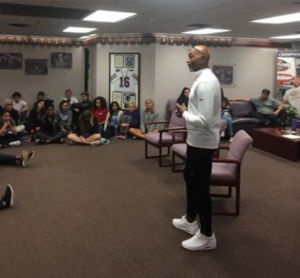 Later Dee introduced World Champ and Olympian Greg Foster who captivated everyone with his amazing story of mental, emotional, spiritual and physical endurance both on and off the track over a career that spanned two decades competing at the highest level in the world of track and field! Dee wrapped up the evening by reminding everyone that 10% of your life is comprised of things that happen to you, but 90% of your life is devoted to how you respond to that 10%. He tied in the personal examples of Parker and Greg with a clear approach…Lead a Life of Character! TotalCourage and Stephen F. Austin University look forward to kicking off a dynamic 2018/2019 Academic Year in September. TotalCourage is proud to welcome Character Coach Greg Foster to our team. Greg was a four-time NCAA national champion (110 meter hurdles and 200 meter dash) as well as an Olympic Silver Medalist and five-time World Champion in the hurdles. Greg joined Founder and Executive Director Dee Daugherty and Character Coach Parker Schenecker for a 3- day visit with coaches and over 110 Track and Field athletes at the University of Southern California and California State-Los Angeles. Team TC was able to help student-athletes and coaches focus on Winning With Character. Parker and Greg shared their incredible stories of resilience, gratitude, and endurance. Student-Athletes at GMC Receive Character Coaching! 2nd Quarter of 2018 has been such a rewarding time for all of us at Total Courage. We truly enjoyed continuing the Total Courage Speaker Series at Georgia Military College followed by a special visit to Gator Country! Dee, Greg Foster, Parker Schenecker and Mike Foley had an amazing visit with the student-athletes and coaches at Georgia Military College. Greg and Mike enjoyed a VIP tour of the campus followed by an office call with US Army Lieutenant General William Caldwell. The Total Courage character coaches attended a GMC Spring Football Scrimmage. After practice Dee was asked to speak to the entire team about the value of humility. 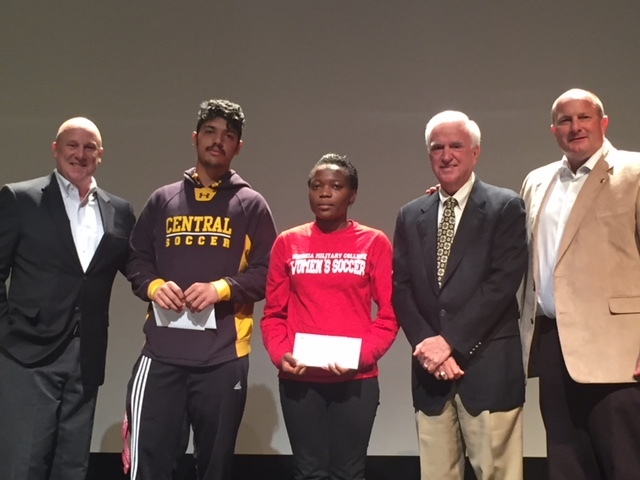 The next day, World Champion and Olympic Medalist Greg Foster spoke to over 200 GMC men and women student-athletes about his personal walk of resilience and endurance. After a standing ovation, dozens of student-athletes remained to engage in personal character based conversations with theTotal Courage team. Thank you to Athletic Director and Head Football Coach Bert Williams for being such a great host! TotalCourage Visits University of Florida Campus… a new Total Courage Campus! While in Gainesville, Dee and Greg had the privilege to work with the legendary Head Track & Field Coach ‘Mouse’ Holloway of the Florida Gators. Currently, the Gators are ranked number one in the nation in track & field and enjoyed earning the indoor national championship earlier this season. The Gators are on board for the 2018/2019 Academic Year with Total Courage and we look forward to a dynamic program developing Leaders with Character! Go Gators!